If you are a Lehigh Wheelmen Association member, and are a "registered participant" (you have signed the LWA rider release form), you are covered through our club policy with Mutual of Omaha. This is summarized below; more detailed information can be found at http://www.amerspec.com/lab/brochure.pdf . 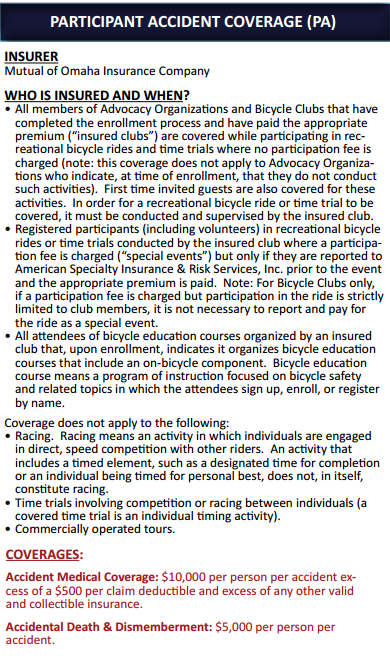 Note that this insurance also applies to any rider who is a "first time invited guest", a non-member participating in their first LWA ride, who has signed the LWA release form for that ride. Also note that your status as a member of the LWA Meetup does not make you a member of the Lehigh Wheelmen Association. To join the LWA, use the Join tab in the main menu. Of course not! Neither was I on the LWA ride on 9/23/15. I made a mistake at ~23 mph and in the blink of an eye I was broken and battered. My personal insurance covered most of the cost of hospitalization, surgery, inpatient rehab. and outpatient PT/OT; however, I still paid ~$1550 out of pocket. I finally filed with LWA's accident insurance at the end of August 2016. Over the ensuing 11 weeks I have received several checks totaling ~$1540. That reimbursement would cover 100+ years of LWA Individual membership ($15 per year), or 60+ years of LWA Family membership ($25 per year). There was no damage to my bicycle, so it wasn't necessary to file an equipment damage claim (I protected my bike with my body). LWA's insurance is applicable for current LWA members on official LWA rides (posted on Meetup) led by current LWA Organizers. First-time guests are also covered. If I had been just riding with friends unofficially (even if all were LWA members) or riding solo, then the LWA insurance would not be applicable. I would have preferred not "testing" LWA's insurance plan, but I'm certainly glad that I had the coverage. 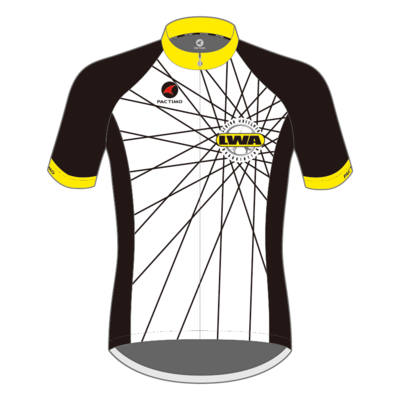 Advice: Don't crash, but if you do, plan to do so as an LWA member on an LWA ride!! !